I hate laundry. Which is somewhat ironic since I am a clothes-horse. But buying and wearing clothes are distinctly different than washing, folding and putting away said clothes. It is a burden I mostly shoulder alone. Sometimes, if I am extremely lucky, my hubs will place his soiled linen at the foot of the bed, instead of kicking it under the bed. I am trying to train my kiddies. They know to put their clothes in the laundry basket; not to put balled-up socks in the washer and to empty their pockets. (We had a disastrous incident involving bubble gum, rocks and a dead frog - all in the same load.) If I bribe them right, (translation, threaten to hang them by their toenails and withhold nourishment) they will even help put away laundry and fold the endless stream of mismatched socks, all the while muttering curse words under their breath. All of this help does little to stem my hatred for laundry. But as the Mom, the job falls to me. So, I spend the better part of a day sorting, washing, folding, stacking and swearing as my piles slowly diminish. Yesterday, I noticed my son only had 2 pairs of undies in the wash. I haven't done laundry in over a week. He has bathed every night. WTF??? And let me tell you, these undies had some serious stainage on the back side. Does this mean, in nine days and after nine baths, my darling son put the same dirty undies on his freshly washed body? And what's with the stains? Does he have a gastrointestinal problem I need to be aware of? Or does he have an aversion to tee-pee? Is this a boy thing no one tells you about? 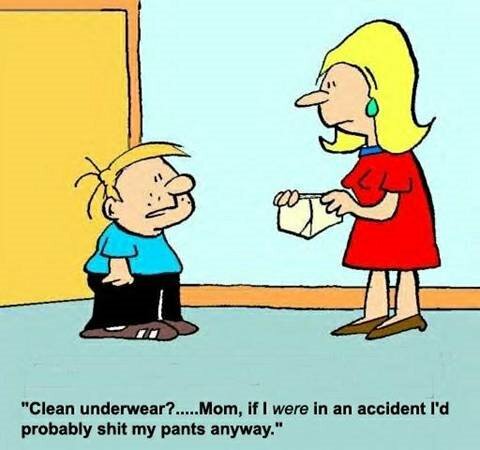 I am going to choose to believe he prefers going commando and this is not a reflection on my parenting skills.